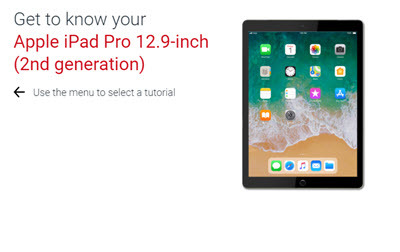 Find device-specific support and online tools for your new Apple iPad (6th Generation) 9.7-inch. Learn how to activate and set up your iPad (6th Generation) 9.7-inch. An interactive map of the Home screen and buttons on your iPad. Discover the features on the back of your iPad. Discover how to change the language settings on your iPad. A visual guide on how to charge your iPad Pro. See how to unlock the screen on your iPad. Find out how to insert and remove a nano SIM card from your iPad.